Includes everything needed: Textures/Displacement, Full body morph, variations, conforming tail figure. Plays well with others. Copy contents to your My Library folder. 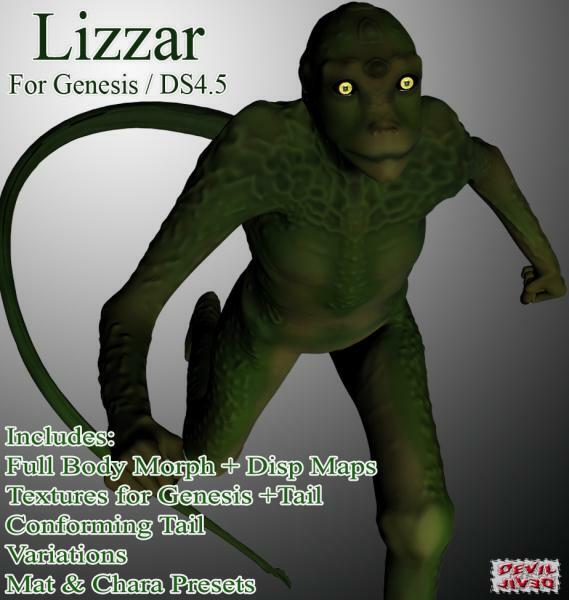 (Typically found in C:/*your user name*/Documents/Daz 3d/Studio/ on a windows computer). Morphs will be in the Shaping/Parameters tabs for Genesis (see below). See: http://docs.daz3d.com/doku.php/artzone/pub/software/dazcontentconfiguration#install_to_the_correct_path for install help, also. *Known Issue (Updated): Mats/ Preset were reading some 0 morph files, and are doubling the My Libraries path for textures. Updated to fix .The errors did not effect the figure (they are just 0's left over from figure compatibility tests. ), but were annoying. :D You can download update, or if using previous version- Materials can be located manually in the My Lib/Runtime/Textures folder. willq (7 months ago) Inappropriate? Whoa. Thanks. Just what I needed. bcharr (3 years ago) Inappropriate? bambooji (3 years ago) Inappropriate? joerandom (5 years ago) Inappropriate? Thank you. Excellent character with so many uses. Devil-Lived (6 years ago) Inappropriate? Midnghtrider (6 years ago) Inappropriate? Great job!!! I'm looking for a Godzilla too..
Janoth (6 years ago) Inappropriate? skywalker77 (6 years ago) Inappropriate? HsiWangMu (6 years ago) Inappropriate? msm903 (6 years ago) Inappropriate?